The world's fastest supercomputer, Tianhe-1A, based in North China's Tianjin municipality, will be available to international clients in the future, although its current clients are mainly domestic. Li Nan, chief project manager of Tianhe-1A, made the remarks at a press conference on Wednesday in Tianjin, after the supercomputer was recognized at a computer industry conference in New Orleans, the United States, on Tuesday. Tianhe-1A, which can perform 2.57 quadrillion computing operations per second, topped the 36th edition of the world's top 500 supercomputers list, the first time a Chinese supercomputer has taken the honor. It was followed by the former No 1 system, the US-made Cray XT5 "Jaguar" at the US Department of Energy's Oak Ridge Leadership Computing Facility in Tennessee. The Jaguar system performs at 1.75 quadrillion operations a second, significantly slower than Tianhe-1A, while running Linpack, the benchmark used to officially determine the speed of supercomputers. "The calculation amount per hour of Tianhe-1A is equal to the one calculated by 1.3 billion Chinese people together for 340 years," Li said. "The supercomputer is not only a great achievement by China, but also a boost to the development of science and technology for mankind." After the official confirmation of its superiority, Tianhe-1A has attracted the attention of international supercomputing experts and some companies, which have expressed strong interest in cooperating with Tianhe-1A in the future, Li said. 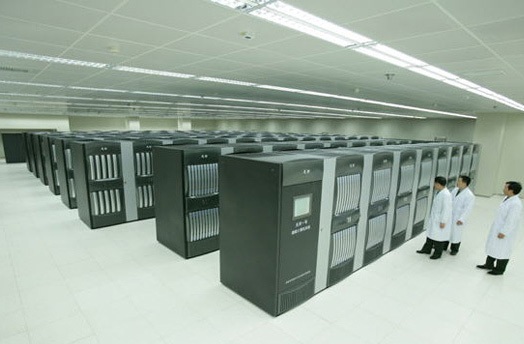 Located in the National Supercomputing Center in Tianjin, Tianhe-1A's services have been offered to more than 20 clients in a variety of application areas, such as oil exploration, weather forecasting, high-end equipment development, bio-medical research, exploitation of new energy sources and new materials, engineering design and simulation analysis. Among the clients, there are not only domestic institutions and companies but also joint ventures such as Tianjin Samsung Electro-Mechanics Co Ltd. There will be more such cooperation in the future, and the supercomputer will be available for international clients, Li said. Tianhe-1A is estimated to have cost 600 million yuan ($90.4 million) and was developed by the Changsha-based National University of Defense Technology. "The key to the high performance of Tianhe-1A is the hybrid architecture of the integration of the CPUs and GPUs (Graphics Processing Units)," said Yang Xuejun, Tianhe-1A's chief designer and a professor at the National University of Defense Technology. Although Tianhe-1A has become the world's most powerful supercomputer, experts said China is still behind developed countries in the research and production of core electronic devices and software. Qian Depei, team leader of Program 863, the high-performance computer section of China's national high-tech development project, initiated in March 1986, said China is still weak in the technologies involved in central processors, system software and computing methods. "Its (Tianhe-1A's) CPUs and GPUs were from the US, the former by Intel and the latter by Nvidia," said Jack Dongarra, a member of the US National Academy of Engineering and supervisor of the Top 500 list.